On the large bead, meditate on the first mystery and pray the Our Father. The Sorrowful Mysteries recall Jesus’ passion and death: The Agony of Jesus in the Garden (Matthew 26:36–56); The Scourging at the Pillar (Matthew 27:26); The Crowning with Thorns (Matthew 27:27–31); The Carrying of the Cross (Matthew 27:32); The Crucifixion (Matthew 27:33–56). The Glorious Mysteries focus on the resurrection of Jesus and the glories of heaven: The Resurrection (John 20:1–29); The Ascension (Luke 24:36–53); The Descent of the Holy Spirit (Acts 2:1–41); The Assumption of Mary, the Mother of God, into heaven; The Coronation of Mary in heaven. Pope John Paul II added The Mysteries of Light, also known as the Luminous Mysteries, in 2002: The Baptism in the River Jordan (Matthew 3:13–16); The Wedding Feast at Cana (John 2:1–11); The Preaching of the coming of the Kingdom of God (Mark 1:14–15); The Transfiguration (Matthew 17:1–8); The Institution of the Holy Eucharist (Matthew 26). 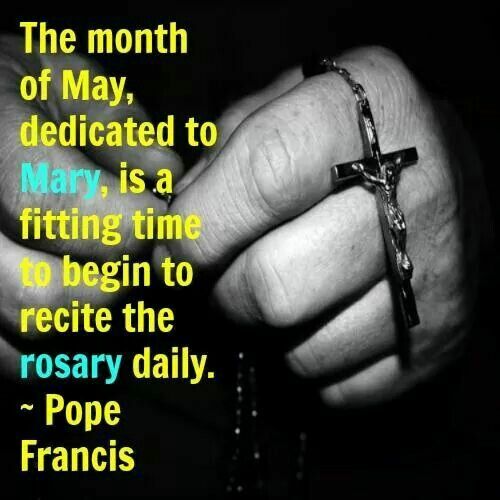 At St James’, we will be saying a mystery of the Rosary every lunch at 1:20. Please do pop in and join us. At the crucifix, begin with the Sign of the Cross and the Apostles Creed. Followed by three Hail Marys. It is customary to say “I offer these three Hail Marys for the increase in the virtues of faith, hope and charity. Now you are at the medal that joins the beads. Here announce any prayer intentions you have. Then announce the first Joyful, Luminous, Sorrowful or Glorious Mystery depending upon what mysteries you are meditating on this particular day. At this point you may read a meditation or look at a picture of the mystery that will aid in your meditation. Then begin the decade with one Our Father all the while keeping hold of the medal. On the ten small beads that follow pray ten Hail Marys. Followed by one Glory Be Prayer. When you come to the large bead, announce the second respective mystery, look at a meditation aid then pray one Our Father. On the ten small beads pray another set of ten Hail Marys followed by one Glory Be and the Fatima Prayer called a decade, as before. Continue this pattern of announcing the mystery and praying a decade. Do this for the third, fourth and fifth mystery consecutively followed by one Our Father, ten Hail Marys, one Glory Be and the Fatima Prayer. After the fifth and final decade has been prayed, after the Fatima Prayer, pray theHail Holy Queen prayer. It is customary to finish the Rosary prayers with the “Let us Pray” prayer from the Breviary followed by the Saint Michael Prayer. Now just as you began, end with the Sign of the Cross.